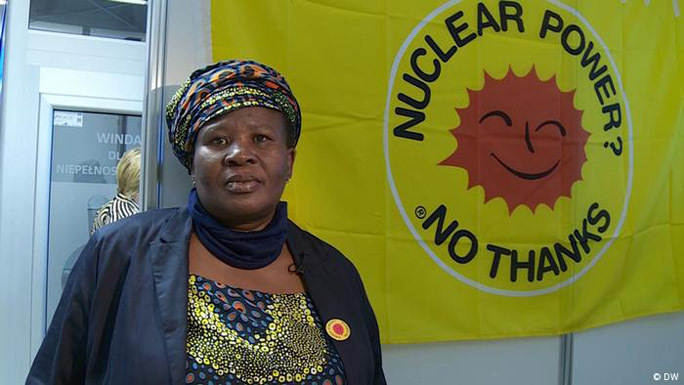 https://www.dw.com/en/there-should-be-no-nuclear-in-climate-financing/a-46740978-14 Dec 18, Prize-winning South African activist Makoma Lekalakala’s successful legal battle to stop a secret nuclear power deal in her homeland won her international acclaim. She tells DW about defending the environment in court. Makoma Lekalakala: My major campaigning issue, it’s mitigation against climate change and with a specific focus on electricity generation in the country [South Africa] — it’s almost 90 percent from coal. And we know that coal is a major contributor of greenhouse gas emissions, so our campaign has been for a just transition towards a low carbon development. We’re demanding a greater investment in renewable energy technologies, particularly that we can have a decentralized electricity system where solar and wind would play a major role. The technology, we need a lot of investment in that so that we can be able to eradicate energy poverty. Local people can have their own socially-owned and community-owned renewable energy projects and co-operatives so that they can have access to electricity. For us to be able to do that, a just transition for us would mean phasing out coal electricity generation and having no nuclear at all as part of the energy mix, and having wind and solar being increased as part of our energy mix. Our main mission is for me to ensure that, or to advocate that, there should be no nuclear in climate financing. Why are you against nuclear power? Earth Life is an anti-nuclear organization, because we believe that nuclear, it’s not safe. It’s an old technology that comes from the war era and it’s not even safe for us to be able to use for various reasons. It’s not economic, it’s quite expensive, it’s not safe, it’s quite dangerous. We can remember all the accidents that have taken place, from Fukushima, from Three Mile Island, and nuclear also leaves a legacy of radioactiveness for hundreds and hundreds of years to come. South Africa has got a principal policy on having an energy mix as part of the energy supply of the country. However, that legislation and regulations imply that if we have an energy mix we should also decide what kind of energy we would want to be part of the mix. What we have in South Africa, which is written in the legislation, is that the energy choice should be least cost. That is having less externalized costs to the environment, to the atmosphere. This is not the case around nuclear. And what we’ve seen is that the government also had flouted regulations and legislation by forcing some Africans to accept nuclear power. Can you tell us more about your legal battle against the controversial secret nuclear power deal between South Africa and Russia? In 2015 October, Earth Life Africa filed papers against the state president, against the Department of Energy, against the National Energy Regulator of South Africa, because we felt that these three institutions were supposed to be able to forward the information that was public information. It was suspected that the political elites in the country were actually the drivers of the nuclear deal. We went to the court based on the legislative and regulatory processes in the country that were flouted, not followed, because all the other agreements were done in secret. That’s how the nuclear industry operates. So we were vindicated that all the processes in the constitution, our regulations, were not followed at all in favor of the Russians to get to build or to construct the nuclear reactors. One of the main issues why we opposed, or why we are opposing nuclear energy, is that we don’t want to turn our country, our continent and the world as a radioactive zone where life cannot exist. What are the main environmental issues in South Africa? The main environmental issue in South Africa, it’s pollution. As we speak now, South Africans, particularly in hotspot pollution areas, are unable to breathe. In Mpumalanga, where there’s almost about 11 coal-fired power stations and coal mines, this is an area that is very highly polluted and it’s one of the most polluted areas in the world. Makoma Lekalakala is director of Earthlife Africa’s Johannesburg branch, an environmental non-profit organization. Together with Liziwe McDaid, she won the Goldman Environmental Prize for 2018 for stopping a controversial nuclear power deal between South Africa and Russia. This interview was conducted by Louise Osborne and edited by Melanie Hall.